James and I originally made this crumble in the summer. We were lazy, so we limited it to ingredients I already had in the house. I wish I had had time to post this recipe earlier in the summer, because my filling of choice is a bit seasonal, but alas, summer is over and so is peach season. This weekend was Canadian Thanksgiving, and my mom let me be responsible for the dessert. Our tradition has always been apple crumble, and we have an apple tree in our backyard, so I decided to re-season the crumble for Autumn. I was so excited to see everyone in my family love the crumble. I had to take rather rushed pictures to ensure I captured it before it was all gone. I think it's the first time no one has made some smart comment along the lines of "it would be great...with some sugar." This recipe was originally meant to serve 4, but I doubled it for my family. For this post, I have included the doubled recipe for the original and apple filling. 1. Prepare your filling fruit (peel, chop, etc...) and toss with lemon juice, cinnamon and cornstarch, ensuring the fruit is covered. Place in a 9 by 13 glass dish and set aside. 2. In another bowl, combine dry ingredients. In a large mixing bowl, combine maple syrup and coconut oil, ensuring the coconut oil is lump free. Add dry to wet and mix thoroughly—until all oats are covered. 3. Spread crumble evenly on top of fruit, and press gently. 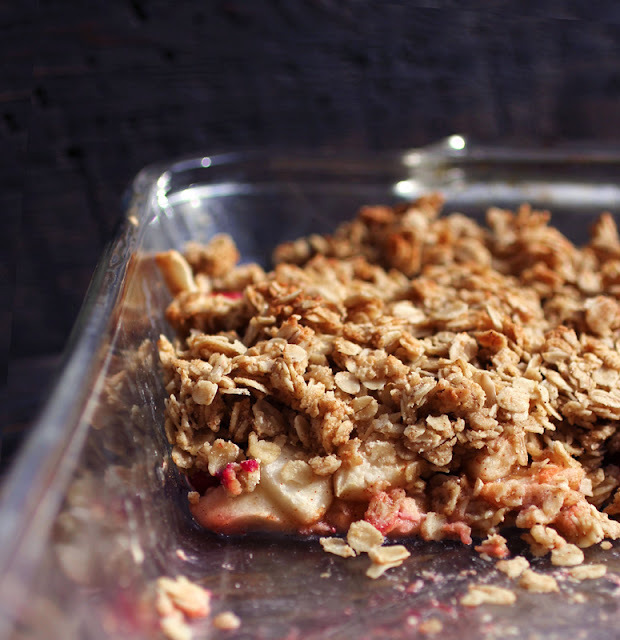 Place in a 300F oven for 30-40 minutes, or until apples are soft and crumble begins to brown. *For anyone who isn't familiar with coconut flour, it's available at Bulk Barn, and probably any health/natural food store. Wow...simply stunning! This sounds delicious! Love your variations for fruit crumble....will be linking back to this post today! This looks yummy! How nice that your father did not criticize your baking this time, given that Thanksgiving is a time in which you are to be THANKFUL for your family, especially those members of your family who COOK and BAKE for you all the time while enduring your complaints.